An alleyway of Tangier as seen through the eyes of a prostitute, the price paid by a sophisticated Cairene philanderer for his infatuation with a young bedouin girl, the callous treatment a young wife receives from the man to whom she has been married. These are some of the themes of the twenty-four stories in this volume, each by a different author and rendered into English by one of the finest translators of Arabic fiction. Among the authors represented are Edward El-Kharrat, Bahaa Taher, Alifa Rifaat, and Ghassan Kanafani. Through the eyes of insiders, these stories show us the intimate texture of life throughout the diverse countries and cultures of the Arabic world. 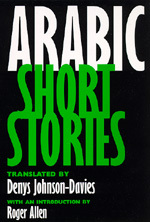 Denys Johnson-Davies has lived much of his life in the Middle East and has published fifteen volumes of modern Arabic literature. He lives in Cairo, Abu Dhabi, and Spain. Roger Allen is Professor of Arabic Literature at the University of Pennsylvania. He is the author of The Arabic Novel (1994) and Modern Arabic Literature (1987).